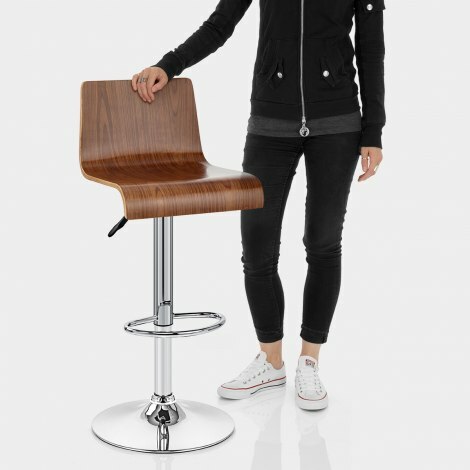 The Slink Bar Stool Walnut is a chic and stylish stool, with a superbly shaped wooden seat. The beauty of this stool is that it will work in a traditional kitchen thanks to the wood, but the contemporary design means it is also ideal in a modern breakfast bar, giving you the best of both worlds. Made from a singular, flowing piece of wood, the Slink comes in a stunning walnut finish that gives it tremendous richness and depth that transmits to any location it is placed in. The seat itself is very comfortable; ergonomically shaped, a high backrest offering excellent support for the entire back. 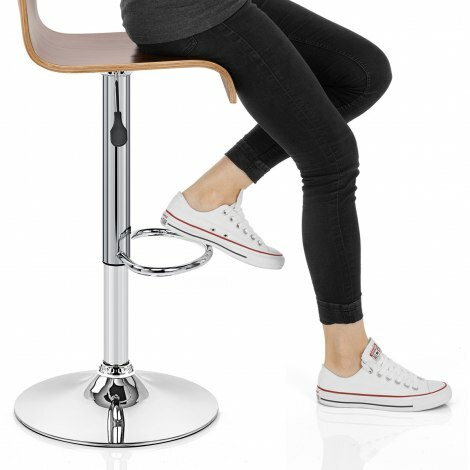 The Slink also comes with adjustable height and 360 degree swivel courtesy of a gas lift mechanism and has a circular base that keeps it stable, and an ideally placed footrest. This base comes with a rubber guard beneath to protect your floor, making this stool a faultless choice. "Not only good to look at they are also very comfortable"
We are not DIYers but having read a few reassuring reviews, we ordered these and were very relieved that the self assembly was minimal and easy. Delivery was prompt. We wanted a product made of natural materials which would compliment our new kitchen, be comfortable to sit on and easy to use and the Slink Walnut Bars Stools are all of these. They have struck the right balance between fitting in to a limited space and yet feeling roomy enough. We have only had the stools for a short time but so far we would highly recommend this product. Delivered quickly, easy to assemble and look great ... thank you. 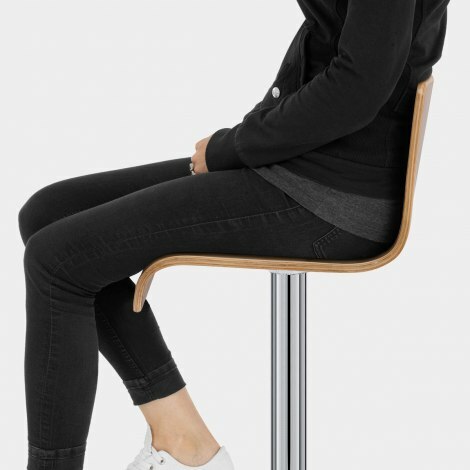 These stools are not only good to look at they are also very comfortable to sit on. They are self assembley and are very easy to put together as they come with an Allen key so no other tools are necessary. I put them together in a matter of minutes. I would thoroughly recommend these stools as they would suit a classic or a contemporary kitchen. We had been looking for a while and could only find leather look ones....really good to find something different. Really quick delivery and easy to assemble, very stylish and comfy !! These stools look amazing and really finish the kitchen off well.